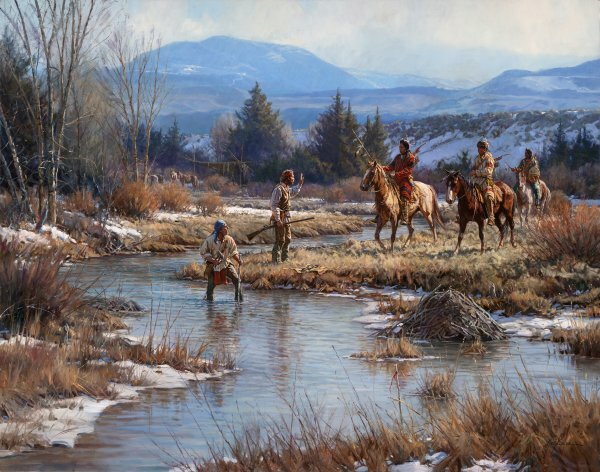 "The setting for the painting is a few miles west of the Wind River, and northeast of the Wind River Range of mountains in what is now west-central Wyoming. The time period is early April of 1833. After having been in winter camp for months, two free-trappers have begun the spring harvest on a small stream where they have discovered a beaver lodge. They have begun the task of setting traps, which includes placing dried wooden stakes a few feet from the bank to which the chain of the trap itself is attached. They have removed their coats to keep them dry, but have left their leggings on as protection from the still frigid waters. In their busy-ness, they have let 3 Indians approach to a close distance unnoticed, and must now deal with the circumstances. The Indians are Crow, or Apsaalooka, and chances are it will be a peaceful encounter, followed by a night of keeping watch over their livestock - as the Crow are well-known for their horse-stealing abilities.